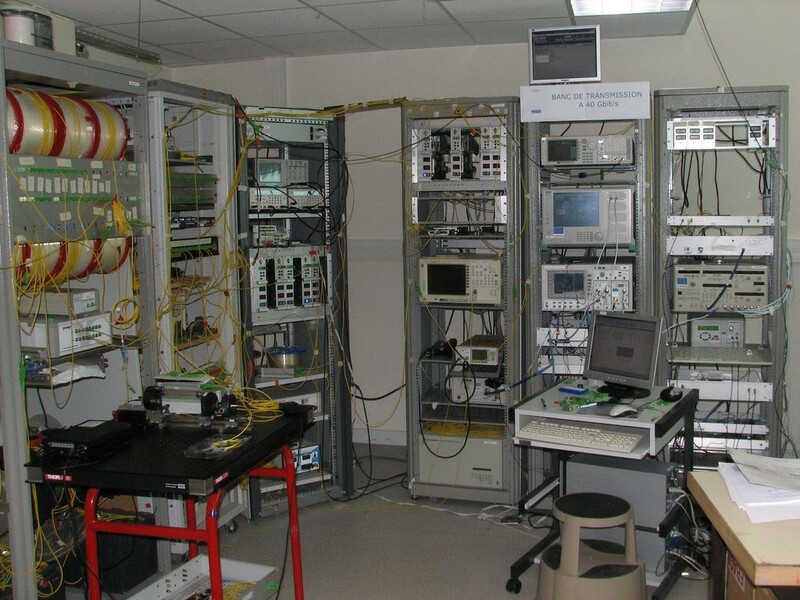 The PERSYST platform offers state-of-the-art equipment for the characterization of high-speed optical communication systems, subsystems and devices, ranging from photonic integrated circuits to optical fibre transmission links. This includes for instance semiconductor lasers, modulators, optical filters, nonlinear waveguide components etc. We can work on packaged devices, but are also highly skilled at handling, coupling and probing unpackaged optical chips. Static optical or electro-optical response measurements. Large signal measurements with digital or analogue signals. Noise measurements including relative intensity noise, phase and frequency noise. Optical coupling benches allowing coupling to various optical waveguide structures, including standard vertical grating couplers, but also more complex coupling to and from photonic crystal devices. DC and RF probing equipment. Vector spectrum analyser up to 20 GHz. Optical spectrum analysers, including high-resolution models (down to 0.04 pm). High-speed sampling oscilloscopes (up to 50 GHz). 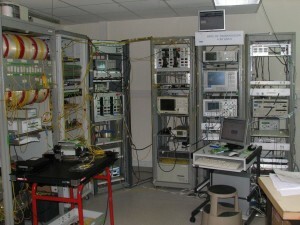 Electrical spectrum analysers (up to 50 GHz). Beyond devices testing, we are fully equipped to perform subsystem and link characterisation, as typically assessed by bit-error-rate and power / optical signal-to-noise ratio penalty measurements. Generation of a wide range of optical signals, including modulation formats such as OOK, BPSK, QPSK, 16QAM, 4PAM, OFDM etc. at symbol rates up to 50 Gbaud. Detection of the aforementioned formats, either using direct detection, interferometric detection or coherent detection. Standard transmitters under the form of XFP modules for short-reach application testing. Optical time multiplexed transmitters at symbol rates up to 160 Gbaud. High-speed sampling oscilloscopes with bandwidths up to 50 GHz for signal and eye diagrams characterisations. Real-time sampling oscilloscopes (40 Gsamples/s, 16 GHz and 100 Gsamples/s, 33 GHz). Arbitrary waveform generators (24 Gsamples/s, 10 GHz, ENOB 12 and 92 Gsamples/s, 28 GHz, ENOB 6). Real-time bit-error-rate testing at symbol rates up to 50 Gbaud. Off-line digital signal processing and bit-error-rate testing at symbol rates up to 56 Gbaud. Emulation of arbitrary filter shapes. Ultra-high-bit rate characterisation thanks to all-optical sampling techniques. Transmission lines consisting of various types of transmission fibres (SSMF, DSF, NZDSF), dispersion compensating fibres (DCFs), optical amplifiers (EDFAs, Raman). You are always welcome to contact us to discuss your optical characterisation needs. Some examples of recent contracts can be found here. You can also check the various research projects in which we are involved.